my pointless: are those potholes half-full or half-empty? 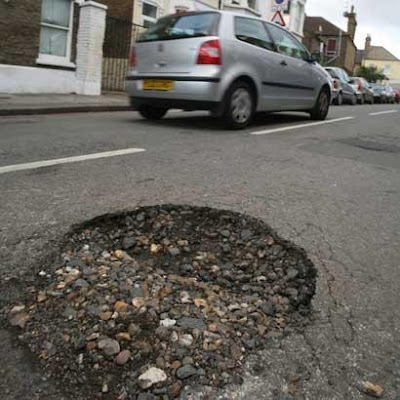 Up until a few days ago, one street in Bloxwich, West Midlands (UK) had three large potholes. Residents were "delighted" when town workmen arrived to fix the holes. However, they were shocked when the workmen left after only fixing half of each of the potholes. They did not "half fix" them by filling them half-full in depth, but half-full in diameter. Yes. They they left behind three potholes that were filled half-way across. Imagine drawing a circle and coloring-in half of it-- that's what they did. Why? It seems that the potholes crossed the boundary lines between public property and the property of the local housing association. The council workers didn't want to risk a lawsuit by doing work that was not on public property. One official explained it this way, "If we had repaired the pothole on Walsall Housing Group land we could have been liable should an incident subsequently have occurred." That makes perfect sense (??). After all, what would happen if someone got injured on a pothole that was completely fixed? One local resident was quoted saying: "I've never seen anything like it in my life. I don't know why they can't just get their heads together with the housing association and sort the thing out."